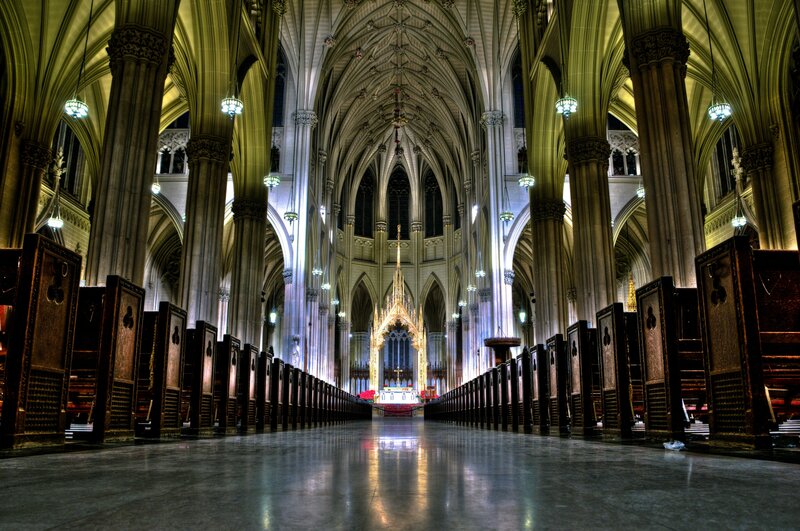 This morning I attended a three-hour prayer service and Mass in Our Lady’s Chapel of Saint Patrick’s Cathedral. The day was jointly sponsored by Lumina and the Sisters of Life. Archbishop Dolan began the day by admonishing those in attendance to respond with love to those who have not yet come to the truth. He recounted a recent conversation with an abortionist who told him that the pro-life movement is winning because we are changing hearts. That’s true. But after the Archbishop spoke, we heard from several with broken hearts. The older couple whose daughter was ashamed to say she was pregnant so many years ago and aborted. The husband was particularly poignant when he lamented that his daughter felt she needed to be perfect before she could be loved by them. The husband who was the one to suggest abortion to his wife. The shared loss of dignity. He stated that there were no words to say “I’m sorry” in a manner that could encompass what he suggested and what they had done. The friend who let her best friend go ahead with abortion for fear of sounding judgmental and losing a friendship. The mother who spoke more to her baby than to us, telling her how very sorry she was, how the baby is never far from her thoughts so many years later. The abortionist whose voice cracked as he recounted having to have talked himself into distancing emotionally from what he’d been doing. The obvious burden he bears, rejoicing in God’s mercy, but unable to shake off all of those deaths at his hands. And so they came and went, a heart-wrenching procession of what some might derisively dismiss as ‘statistical noise’, which is to say an artifact in the numbers. In truth, the sorrow was almost unbearable. As I sat there, I silently asked for God’s forgiveness that I am so late to the table. I was also inspired by each presenter’s witness to God’s mercy; “An ocean of mercy,” as one presenter put it. That’s the beauty of Christianity in general, and Catholicism in particular. We never stop proclaiming the love and mercy of our Father in Heaven, who is Love and Mercy. As I listened to the doctor speaking, I was struck by the thought that indeed God’s Love is infinitely greater than the worst sins of those among us. It’s simply there for the asking. I thought of the older man lamenting how his daughter felt that she needed to be perfect in order to be loved by him. Now, if that man with all of his sins doesn’t require perfection as a precondition for love, how much less does God the Father expect us to do it all on our own before coming to Him? It’s impossible and even futile to try. Words to consider as we head into the anniversary of Roe v. Wade. We ought not yield to despair over our particular failings, but drown them in the ocean of God’s Love and Mercy. How very true. He must have seen ALL of this. It must have been almost unbearable. I remember a priest telling me that many women in confession tell him that they think almost every minute of every day about the baby they killed. There is a certain arrogance in speaking of those who have not yet come to the truth. Its not an arrogance worth being outraged about, it can better be dismissed with good humor. We all have a right to proclaim to the world what we BELIEVE to be true. Thank God we also have a pretty well established right to choose for ourselves what voices to listen to. The Roman church has come a long way since it applied very similar logic, not to love those who “have not yet come to the truth” but to torture them on the rack and burn them at the stake. I don’t mention that because I think every institution should eternally pay the price of sins committed generations ago. Rather, I find the root of the violent response in the arrogance still present in the moderated voice of today. In response to one of my own posts at Alexandria, Crossroads of Civilization, attempting to distill what I’ve learned talking to people at this site, an attorney noted that one of her clients had been thrown out of the house by her parents because the pregnant daughter REFUSED to have an abortion. Lovely and very moving. Ignore the not so subtle attack on the Roman Catholic Church. Too bad about those saintly Calvinists who burned Servetus, the Lutherans after the Anabaptists, and the Communist/Fascists who’ve tortured and murdered millions. ah yes and not to mention the Muslims systematically destroying the Coptic Christians in Egypt, liberal secularists who are intolerant of Christian values and the Protestants I’ve met who think Catholics are Satanists…..
then why mention it except to stir up controversy….??? I’m assuming of course that you are talking about liberals who are so called “moderates” supporting “choice” and who attack Christians in the public square for their views on abortion, contraception etc. You know the liberal moderates who try to force Christian schools to teach values against their core beliefs, the liberal moderates who try to force pharmacists, nurses and doctors to perform/assist in procedures that are against their moral values, the liberal “moderates” who fire people for praying….. It isn’t arrogance at all. The arrogance is on the part of those who would tell women that a child is a blob of tissue. These same people assiduously avoid showing women the baby on the ultrasound as they prepare to destroy its life. Why? Why do these same people resist the opening of crisis pregnancy centers so close to their abortuaries? Therein lies the very definition of arrogance-to take unlawfully to oneself. In this case, that would be the arrogating of the truth regarding the development and humanity of the baby about to be killed. It is the unlawful taking of a human life. Why the depth of pain and suffering, misery and despair, guilt and torment over having this little procedure, removing an inanimate blob of tissue? Why no similar depression and despair over an appendectomy or tonsillectomy? Because the truth is written on our hearts, as St. Paul said. That truth cannot be suppressed or denied indefinitely. Yes, we pray for all to come to this universal truth. on January 17, 2010 at 1:58 PM Barbara C.
I am not really sure what your point is in mentioning this. That it’s sad that someone’s parents would act like this? That fear (sometimes unfounded/sometimes founded) of this happening leads young women to have abortions out desperation? That if the girl would have just had an abortion her life would be better? I’m proud that my Catholic parish has the Project Gabriel ministry that reaches out to women (of any faith) in that situation: finding them homes, taking them to doctor appointments, helping them find financial support and deal with legal issues, collecting baby supplies, and helping them get back on their feet. And I am glad that there are groups like Feminists for Life who also look for ways to help young pregnant women on college campuses feel like abortion isn’t their only option by offering many of the same services in addition to setting up single-parent housing and daycare services while the mothers go to college. People always call abortion “a right to choose”, like it’s the same as choosing between chocolate or vanilla. When really a lot of women “choose” abortion because they feel like they do not have a better choice. If our political elections have taught us nothing else, the choice between the lesser of two evils is no real choice at all. The God Who is Mercy and Love, is also the God Who is Truth. He wants us to know Him. It is only because He wants to reveal Himself to us that we can know Mercy, Love, or Truth. It is not arrogance to say we know the Truth any more than it is arrogance to say God has forgiven us. We don’t discover these things on our own. God reveals Himself to us. God is, be definition, Truth, because if all that we know was created by a transcendent God, nothing can be True that is not will by God to be True. Our point of departure is what any human being can know of what God’s truth is. You should all have guessed that with my attitude toward the earthly authority of anyone claiming to speak for God, I would be a fan of Michael Servitius, not of John Calvin. There are many false authorities in the Protestant realm. In fact, I authored a satirical piece about Archbishop Chaput and Rev. Jerry Falwell plotting a merger of the Southern Baptist and Roman Catholic churches, getting into a little tiff about who was going to be Pope in what order. Gerard, getting to the real substance, you seem to be arguing on two very different scales. On the one hand, there is the authority, or arrogance, of speaking for God on the entire nature of the universe and moral law, on the other, there is the arrogance of denying that a fetus is a human being??? Very general and comprehensive on the one hand, very specific subset on the other. If you prove to be correct on abortion, you would be correct, not because your church said so, but because it is true, whether this or that church says so or not. We all try to be right as often as possible, but we could all be wrong. Perhaps it’s my head cold which has addled me somewhat, but I’m not following your last paragraph. SJ: if any church has a chance of discerning what is the truth it is the Catholic Church. In matters of faith and morals the CC has the guidance of the Holy Spirit – a promise from Christ himself. No other church can make that claim. I wish I could have been there, Gerard! It is amazing to share what abortion has done to you and others in your life and feel the unconditional love from those who are REALLY listening. Or two crappy major political parties in general. Mary Catherine, EVERY church is inspired by the Holy Spirit. You should try visiting a few. I’ve been to mass several times. All churches are staffed by fallible human beings. I expect the Roman church (which has never in its history been catholic), does have insight into a portion of the truth. But not all, and probably not most. I called the first sentence arrogant, because it arrogates to the speaker complete and perfect knowledge of The Truth, not a truth, but all the truth in God’s creation. You responded with the second sentence, which in a much more narrow context suggests that people who have a different view than yours on a specific question of biology, overlaid with the metaphysics of ensoulment, are arrogant. A similar pattern, but on a very different scale. Actually, we believe that the Truth made Himself known, and has granted the charism to make known faith and morals to his bishops, the successors of the Apostles. Look at the reading from Ignatius I posted yesterday. He was a contemporary of the Apostles and their disciples. SJ… speaking of arrogance, rather I find it more ignorance rather than arrogance to claim that all churches are inspired by the Holy Spirit. While that may be true (if you can attach that claim to the fact that a person can be inspired, then you’re correct), there is only ONE church that Jesus Christ himself started, of which he clearly stated that the Holy Spirit will guide in truth and morals, and that’s the Church He started… which would be the Catholic Church. I guess what confuses me, actually just makes me pause, is that you claim people aren’t allowed to make connections to the Truth. Wouldn’t that also include you? So if Archbishop Nolan, or Gerard, or anyone else that’s pro-life for that matter, is wrong, who’s to declare your accuracy? (not trying to be a snit, but just really trying to understand the hesitation in believing what has been taught as Truth for thousands of years, of which came directly from Christ). I’m sorry SJ. That is NOT what I believe. The Catholic Church was founded by Jesus Christ and he promised Peter the first Pope that the gates of hell would not prevail against her. BTW, as a young person I attended virtually every known Christian denomination. The difference for me in the end was the Real Presence of Christ in Catholic churches, in the form of the Holy Eurcharist. The living God is present in our church and no other. If any of you are in DC this week we will be doing the Prayer service at the Basilica of the Immaculate Conception in DC on Thursday in the crypt church. At the end of the last testimony, as the speaker left the podium, sunlight burst through the stained glass in the chapel and it penetrated one panel – the Last Supper and the Eucharist. You all have every right to believe everything you have said. As you must know, there are more Christians in the world who do NOT believe that the Church of Rome is THE church founded by Jesus Christ, than those who do believe it. I would even agree that the evangelism of Benny Hinn is most likely NOT inspired by the Holy Spirit, and there may be others, but the Roman church has no basis to claim a monopoly except its own claim, which others are free to disregard. I believe that John Wycliffe had it right, long before Luther or Calvin: man has no earthly spiritual overlord, just a direct line to Jesus. We all have to read Scripture for ourselves. For some centuries after the time of the Apostles, the bishops of Rome held no primacy over any other bishops. That they acquired this primacy was a matter of politics, not anything Jesus said to anyone. The reason the Greek Orthodox and Coptic churches are separate from Rome is that they were NEVER under the jurisdiction of Rome. The reason Protestants are separate from Rome is that we or our ancestors chose to throw off an unnecessary, and at times in history, a harmful and dangerous, line of human authority. It doesn’t mean you are bad Christians — but your church has no authority other than what you each voluntarily choose to give it, and that is your sacred right.